Manchester City jumped three places to second in the Premier League table on Monday night by beating Bournemouth 2-0 at Dean Court. Pep Guardiola’s men dominated the game – bossing possession with 62% and firing in 17 shots, compared to five from their opponents. 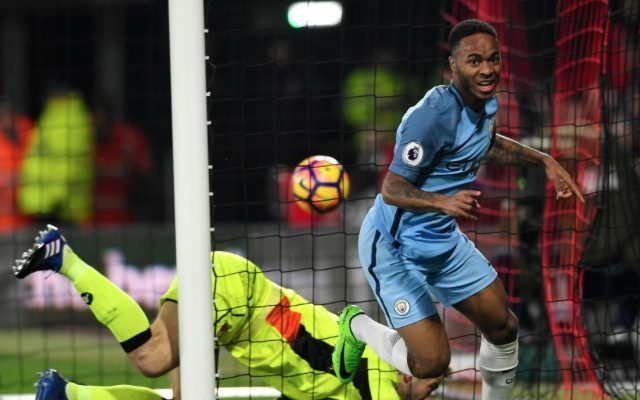 Raheem Sterling found the net with one of five City shots on target to give his side the lead on 29 minutes, before his cross for Sergio Aguero deflected home off Tyrone Mings, who was credited with a 69th-minute own goal. Aguero did not start the match, but he played most of it, having entered the action as an early sub, replacing Gabriel Jesus when the Brazilian striker limped off with an ankle problem inside the opening 16 minutes. Bournemouth also lost a star man to injury ankle, with Jack Wilshere making his exit just before half time. City hit the woodwork twice – once through Sterling at 0-0 and then again courtesy of Leroy Sane in the dying minutes. Sterling was easily the man of the match, but makeshift left-back Fernandinho also deserves a special mention for a display which saw him make 101 touches, 68 passes, six tackles and two interceptions. Artur Boruc 7, Adam Smith 6, Simon Francis 6, Steve Cook 7, Charlie Daniels 6, Andrew Surman 7, Jordon Ibe 7, Harry Arter 6, Jack Wilshere 5, Ryan Fraser 5, Joshua King 6. Subs: Benik Afobe (47′) 6, Tyrone Mings (22′) 5, Marc Pugh (75′) 5. Willy Caballero 7, Bacar Sagna 7, Aleksandar Kolarov 7, John Stones 7, Fernandinho 8, Kevin De Bruyne 7, David Silva 8, Yaya Toure 6, Raheem Sterling 9, Gabriel Jesus 5, Leroy Sane 7. Subs: Sergio Aguero (14′) 7, Nicolas Otamendi (69′) 6, Nolito (91′) n/a.